Read my thoughts on To All The Boys I've Loved Before and P.S. I Still Love You, the first two books in the trilogy by Jenny Han. It's the end of a trilogy, I'm afraid. I've had so much fun reading the To All the Boys I've Loved before series over the course of the past couple of years. I picked up the first book on a whim partially because the cover was pretty and because I had seen a lot about Jenny Han on Tumblr through pretty mood boards and photosets to relate to her books. After accidentally spoiling both the ending of the first book and the second book in a rogue Google search, I was very excited to have the third book to myself, untouched by internet spoilers and my own curiosity. I had completely forgotten that the third book was coming out this spring. I finished the second book at the end of August in 2015 and remember thinking that spring 2017 felt like it was so long away. Then May 2017 came and I was walking through Barnes and Noble with my roommate before our pedicure appointment the week before we moved out and I saw the book and realized how fast time truly does pass. I was re-reading my review from the previous book and I'm very surprised that I didn't like the ending. 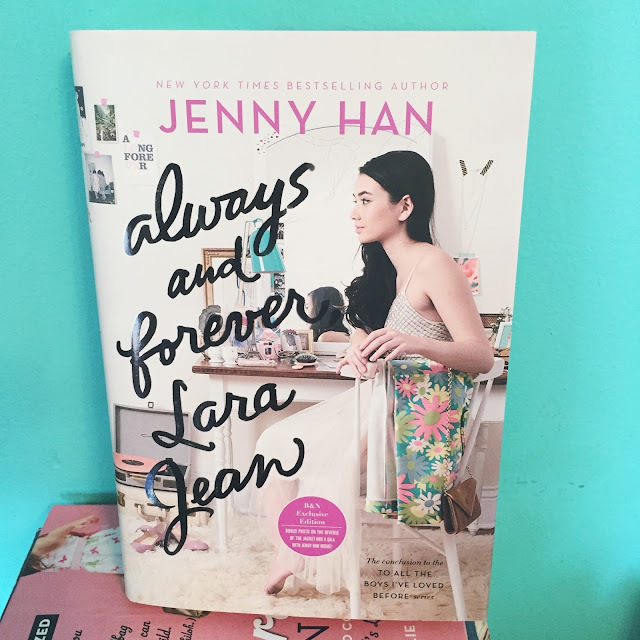 I didn't even remember that I didn't like the ending because as soon as I dove into the first chapter of Always and Forever, Lara Jean, I felt like I was embraced in a warm hug from each of the characters. If you haven't read the first two books, perhaps skip over this review, because it will probably include spoilers because my reviews are less about the writing and more just one massive spoiler because I don't know how to vaguely and mysteriously describe story events. This book takes place during Lara Jean's (and Peter's) senior year of high school, their one last hurrah before they're both set to attend University of Virginia (UVA)–Peter on an athletic scholarship, Lara Jean in regular admissions–in the fall. Our favorite couple plans their futures around attending the same school only fifteen minutes home. Lara Jean has second choices, sure, all hours away from home where her younger sister Kitty–now eleven and spunkier than ever–and her dad still live. But Kitty and her dad have their next door neighbor Ms. Rothschild to keep them company, even to fill a void in the family since their mother passed away. The whole premise of the book is about choices and what you're supposed to do when your head and your heart say different things. I'd like to think that based on the outcome of the book, sometimes choices don't have to be made. Sometimes the head and the heart can both get what they want. Or even if both don't win, one side will adapt. Always and Forever, Lara Jean was not lacking any of Kitty's incredible one liners. Lara Jean's stress-induced quest to bake the perfect chocolate chip cookie was both hilarious and slightly worrying (I see quite a bit of myself in Lara Jean, though I typically have less food-related stress tendencies). Peter Kavinsky was handsome and adorable as ever, even in the dreary moments where he and Lara Jean were not on speaking terms. He has a little lick of jealousy in him and isn't the best at talking about his feelings, but I think Lara Jean really drew the best parts of himself out of him and even if in the alternate universe after this book ends they don't end up together, I think Peter will still be a better person because of their relationship. I just love this little tiny world that Jenny Han created. I love the characters she wrote, with all of their quirks and idiosyncrasies. I love that she created an incredibly close and realistic family dynamic with the Song girls and their father raising them as a single parent. I love how she created a world in which embracing your heritage (in the case of the Song girls, Korean) is made important, because, well, it is. This trilogy was a pleasure to read and I'm so sad that it's over, but I feel so much lighter because of the ending. Does that even make any sense? I was so content with the entire series that it felt like I was floating while I was reading it. Okay, I mean, I think I dropped to the floor during the dramatic moments AKA any time that Lara Jean would fight with her sisters or with Peter or that whole love-triangleish situation from the last book and also the "HOLY CRAP, ARE LARA JEAN AND PETER FO'REALZ GOING TO BREAK UP RIGHT NOW I CANNOT HANDLE THIS!!!!!!!" I digress. This book was about high-schoolers having wedges thrown in their plans and having to work around them. It was about making choices for yourself and your future, even if it might affect other aspects of your life. It's about trying new things and going new places. Lara Jean is torn about where to go to college, but that doesn't mean this can't apply to someone who's torn about what to do after college. This book has been my favorite in the series because I have never felt closer to Lara Jena than I did when I finished this book last week. If you need a good summer series to read, I highly recommend checking out this series by Jenny Han! You will not be disappointed. Plus, when you're finished reading, the books made wonderfully aesthetically pleasing room decor!